The winner-take-all system seems appears to be a natural way to elect leaders or political representatives. Whomever gets the most votes should be the winner, right? You have 5 candidates running for 3 available positions on your student Senate. This means you can elect 3 of the 5 people to represent you. In a regular winner-take-all system, you will cast 3 votes for the three people you want to represent you. Your vote will be non-transferable since you cannot rank your choices. Without STV, the three people who received the most votes will win the election. The below graph helps elucidate this point. * Candidate 3 is clearly a favorite among voters, and wins 41% of the votes cast (not a majority, but a plurality). Candidate 2 and Candidate 5 win the other two available seats with 18% and 17% of the vote respectively, while Candidate 1 loses with 16% of the vote. It becomes difficult to see how this system is fair to Candidate 1, who lost her seat by a mere 1%. Where is the mandate to represent the student body when an individual candidate only garnered 1-2% more than the losing opponents? These candidates barely won this election, yet in a winner-take-all system have the ability to claim that they represent the electorate. This is a real and present problem in almost all winner-take-all elections. In comparison, STV allows you to rank your choices**. Not only does this offer you better choice, it allows for better representation of all political opinion on your campus. Additionally, the way the votes are counted (please click here for a more detailed and technical demonstration on how this is done) gives the top three winners a stronger mandate to govern, as they all have to pass a threshold in order to be elected. When you rank candidates your vote can also become transferable. 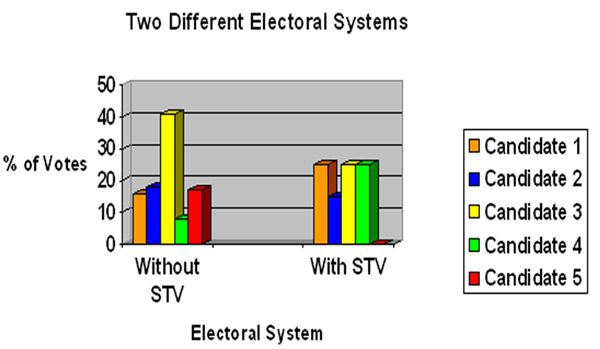 The three winners in the STV version all represent individuals who received more or an equal amount to the threshold for this particular election. *This is a HIGHLY simplified graph, and does not represent all the details of STV. It is simply used for illustrative purposes. **If you don’t want to rank all of the options available (in this case five) you don’t have to! You can rank anywhere from none (spoiling your ballot) or all the candidates involved in the election.